Why Does Jewelry Stain My Skin? Has gold and other jewelry ever left greenish or black marks on your skin? It's happened to most of us at least once or twice. Even though some people are allergic to certain materials, most staining isn't caused by an allergy; it's a reaction between our skin and the metals used in jewelry, especially when the jewelry touches areas that perspire. Here are some common metals that can stain your skin, why it happens, and how to prevent it in the future. Copper often turns skin green. The piece you're wearing might not be pure copper, but it could have enough copper in it to cause a reaction. Some people seem to have a body chemistry that's prone to staining even when a tiny amount of the metal is present. Think of how copper turns green as it oxidizes. That same tarnish is transferring to your skin. Sterling silver is 7.5 percent copper, so you could have green stains from the copper. The most common stains from sterling silver jewelry are black, though, and occur when the silver tarnishes. Unlike copper that turns green, silver darkens to a black color due to a reaction with gasses in the air. Some sterling pieces are coated with products like rhodium that help keep them from tarnishing, but the coatings will wear off in time. Gold Shouldn't Stain Skin, Should It? Gold itself hardly ever stains your skin; it's the other metals that gold is mixed with (to create an alloy) that cause the problems. Copper, nickel, and silver can be used to alter the color of gold and make it stronger and more affordable. Any of those metals can cause discoloration on your skin. The lower the "K" number on your gold (Karat), the less pure gold it contains. Some people never have a reaction to the metals in even 10K gold, but others must buy 18K pieces to stop the discoloration. If you are allergic to nickel, you won't just have stained skin. For those with a nickel allergy, jewelry that contains nickel will make your skin itchy and red where it comes in contact with your body. Gold-filled jewelry is made with a thicker outer layer of gold, so it doesn't wear off as quickly. Antique gold-filled jewelry that is already beginning to wear, however, might stain your skin more readily. Rose gold-filled jewelry with a lot of copper may also stain your skin even before the gold portion wears off. If a piece of jewelry stains your skin, figure out what metal that jewelry is comprised of. If the staining is severe, avoid that metal in the future. If cheap jewelry is staining your skin, it is likely the nickel that is the culprit. 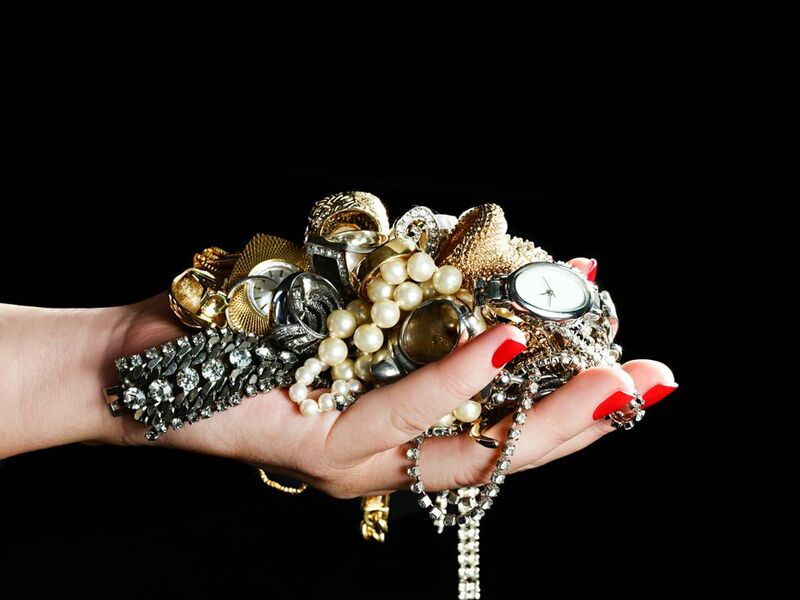 Try costume jewelry that is labeled nickel-free and see if you still have the same issue. If gold is staining your skin, try switching to 18-karat gold, a more pure metal. Also, try yellow gold instead of white or rose gold, as the alloys in either white or rose gold could be causing the reaction. Platinum is expensive but rarely reacts with our skin, so it is a great choice for people prone to staining or metal allergies. Ask your jeweler if the piece can be coated with a new layer of metal (rhodium if it's white gold) or a clear protective film along edges that touch your skin. Coat the jewelry with clear nail polish. Choose stainless steel jewelry when possible, especially for body jewelry. Titanium is another metal choice for its non-staining qualities and for people with allergies to some metals. Try jewelry labeled hypo-allergenic. It's formulated for people who are sensitive to metals. Keep your skin dry when wearing jewelry. Don't wear your jewelry while working out or when you're sweating or exposed to liquids. Wear offending pieces for only a short time and see if the staining improves. Keep your jewelry clean and tarnish-free.